About 1 lb. of flank steak or top round, slice against the grain in thin slices. (Like the way you were to slice for Fajitas) Flank Steak recommended. French Fries are ready to be fry (peel and cut), or kept warm in the oven if they are done before the Lomo Saltado. All the Mise & Place is ready to go before you attempt to start cooking. Set the table, make a salad a drink. And gather your plates. Pre-heat a large shallow sauté-pan, add the cooking oil. Meat is done when the color change to a nice seared caramelized, still a little red if possible. Do not overcook. Reserve the beef on a side tray and cover to keep warm. Add some water to the sauté-pan to deglaze, and save the deglazing pan juices with the reserved beef. Heat the sauté-pan again (do not need to wash), add the oil and heat throe. Incorporate the Onions. Toss for 2 minutes, add the garlic and aji amarillo and toss for 1 minute. Add the Vinegar and Cover to braise them and to evaporate the vinegar for just 1 1/2 minutes. Open and immediate add the tomato paste and soy sauce, maybe some water (keep it juicy), add the tomato wedges, a little more of the vinegar, cook the vinegar off and return the beef to the saute pan. Mix well, check for having some juice if is a bit dry, add water. Turn off. When the heat is off add the parsley and mix it in. Serve with rice and over the fries, make sure to add some juice to each plate. I did not put amounts of the seasonings because I firmly believe it depend on the cook, but don't be afraid to spice it up. Make and try what you are cooking to get familiar. If you rather make Saltado de Pollo. (Chicken Saltado), use an already cooked grill chicken, slice it thin and proceed the same way, but in the first part don't cook it for too long. Remember is already cook, just give it the flavor and the juice from the seasonings!!! 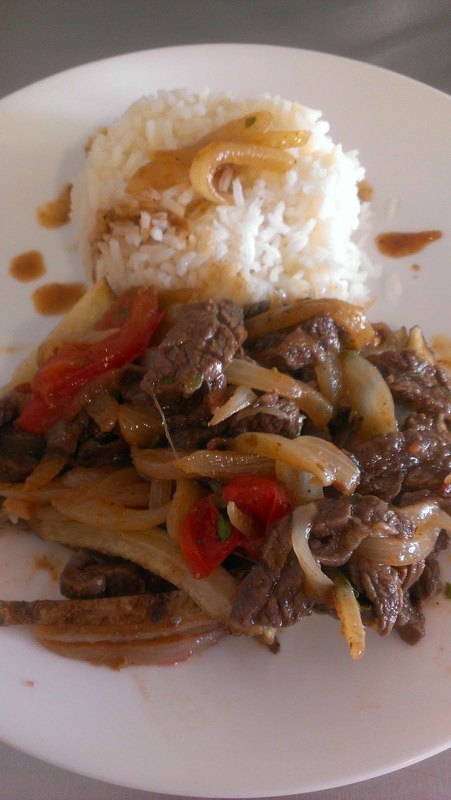 Remember to have Fun and Enjoy one of the favorites meals that many mothers cook as a daily basis in Peru.